Does anyone know how to build a thermosiphon water heater? I'm building my own hot tub, and need a heating system. The "Shintu???" systems, seem simple enough..but cost more than the inflatable tubs I've been looking at. Plus..I like the satisfaction of building something yourself.. anyone??? Is a case of beer in it for some good plans! anything worth doing is worth overdoing..
A thermosiphon is actually very easy to set up. First off, your heat collection must be located lower than your heat storage. Then you must make sure that you are never trying to work against gravity. If you are wanting to make a hot tub, take the drain of the tub, always going down hill, to the bottom of your heat collection device. In the heat collection device, water must flow continuously up. From the top of the heat collector, the flow must go up and back into the storage area near the top, but below water line. The key is to have a path for the "cold" water to always go down, and the "hot" water to always go up. 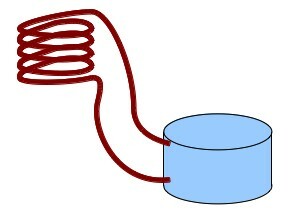 If you build any loops in the system, this is known as a thermal trap, and will stop the siphon effect. This is why domestic hot water heaters have the loops above the tank. If you are wanting to heat with solar, you can either make or buy solar collectors. For sizing information, a reasonable solar collector will heat 125 gallons of water 1 degree F per day for every square foot of collection area. Thus, a 4' by 8' collector would heat a 250 gallon tub approximately 16 degrees. Now just scale accordingly. If you want to reach for the stars, you better have long arms! Thanks!! I someone a beer. ygmir, I still owe you that absinthe.. I was wondering anyone had any ideas about if the thermosiphon system would work if the pipes had to come up over the rim of the tub and then down to the heating system which is lower than the tub? a bit like son of uglies pic but without the pump and lower fire business. I can't cut a hole in the tub because I'm borrowing it. I'm trying to make a hot tub for a hogmannay party here in scotland on my parents' farm - there are lots of useful bits of stuff around, it's like scrap heap challenge. I hope you all have a wonderous time at your next festival - it sounds spectacular, maybe one day I'll come! And as new year's pretty soon maybe I'll find out from trial before I hear any opinions - so I can tell you of the success or otherwise. This crew is very creative in their portable hot tubs: http://www.jaccuzzi.ch/. It's not rocket science. You might want to keep on the down low, pools are regulated by "the man". The other concern is washing off the dust before partaking. Lining up onsite water delivery too. Nectar Village has had a steam bath for a while. Enjoy! stargeezer wrote: First off, your heat collection must be located lower than your heat storage. Then you must make sure that you are never trying to work against gravity. I assume you mean that the heat must be no higher than the bottom of the storage and the collector output no lower than the top? Or does the whole collector need to be lower than the storage? But if the heat collector were higher or lower than the heat storage, then it wouldn't work, right? ... but then as long as the pipes in the open system above stay filled with water and are submerged, it should work the same way. The gist is that the although the water may be higher or lower, any time it is moved, the same amount displaces it at the other end which cancels out the effect of gravity. Kind of like a bicycle wheel lifted off the ground: it can spin because when the weight on one side drops, the other side rises, so there is only inertia to overcome. I think I may have a bit of a grasp on this. The pumping action works by convective force in the heat collector, right? So the tubing in the heat collector must be oriented to take advantage of that force (e.g. always slope in one direction vertically, or just be a set of straight vertical pipes) so the water from the heat storage can enter at the bottom and leave at the top. If the rest of the pipes were perfectly insulated, then their orientation will not matter. As far as I can tell, if a reverse convection force can be prevented in a pipe by insulating it, its orientation won't matter. Loops are only a problem because convection within the loop will block the flow; if a loop were insulated, it wouldn't affect performance. Gravity, when combined with the different densities of water at different temperatures, causes the convective force. Water does not "flow down" (as in downhill) from the heat storage tank — it is pumped by the convective force. Thus, the relative height of the heat collector and heat storage does not matter with rigid-walled pipe (garden hose will pinch itself shut if the rise is too great and the water is not under pressure like it would be in this system). This makes sense to me. In closing, I believe that Carthage must b... an 11th Principle must be enacted: Radical Responsibility. We use the Chofu brand stove at the Steam Bath Project, but we have also had good luck with various home made from beer keg contraptions. Here is a picture of an artist made beer keg version of a "Chofu"stove. 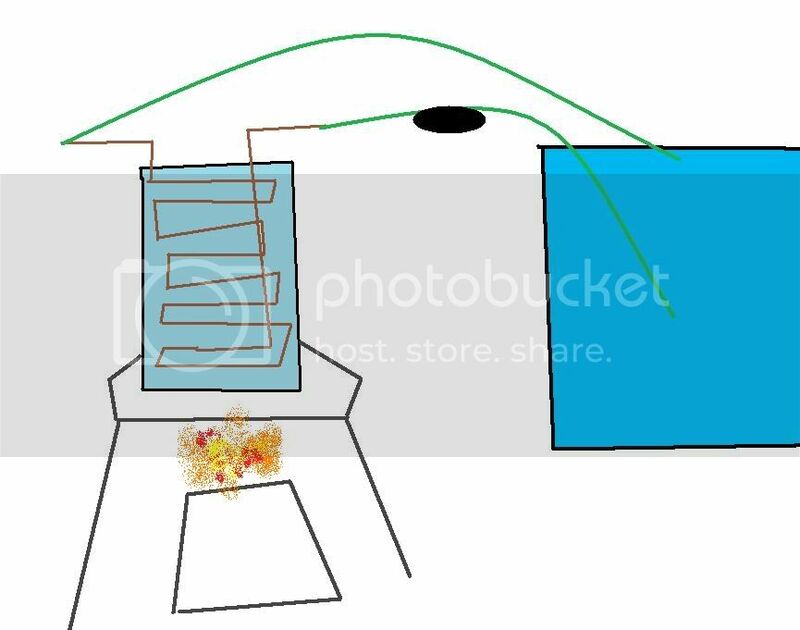 This drawing shows how to turn two beer kegs into a water jacket stove. Hate reading my replies? Click here to add me to your plonk (foe) list. 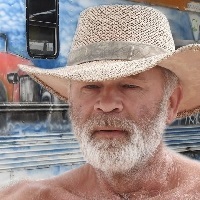 Here is an image clipped from this site, http://www.islandhottub.com/woodhtr.html . some seeing eye wrote: This crew is very creative in their portable hot tubs: http://www.jaccuzzi.ch/. It's not rocket science. You might want to keep on the down low, pools are regulated by "the man". The other concern is washing off the dust before partaking. Lining up onsite water delivery too. Nectar Village has had a steam bath for a while. Enjoy!